Bollywood Gossip- Amitabh Bachchan, Rekha spotted on the same flight ? Bollywood actors Amitabh Bachchan and Rekha were spotted on the same flight recently. The ‘Silsila’ couple has been one of the most controversial topics in Bollywood as once there were rumours about Amitabh and Rekha’s sizzling chemistry off screen. 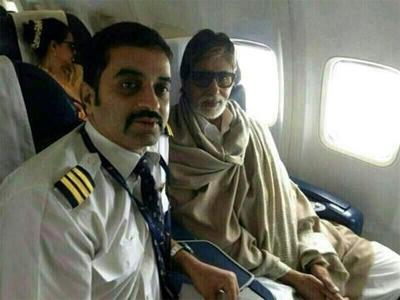 In the picture, it seems like one of the pilots of the plane clicked a picture with Big B during his travel and Rekha was spotted relaxing in the seat right behind the superstar. While they haven’t been seen together even on screen after Yash Chopra’s ‘Silsila’ in 1981, the two were recently spotted travelling in the same flight. Quite a coincidence for the two superstars who haven’t been sharing screen space for more than three decades now!